In September of 2005, Abbie Johnson married Bill Taylor. She was in her mid—forties, and he was nineteen years older. Three months later, Bill suffered the first of two strokes that paralyzed his left side and confined him to a wheelchair. 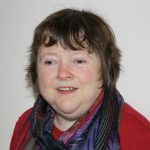 Abbie Johnson Taylor, once a registered music therapist, uses prose and poetry to tell the story of how she met and married her husband, then cared for him for six years despite her visual impairment. At first, there was a glimmer of hope that Bill would walk again, but when therapists gave up on him seven months after his second stroke, Taylor resigned herself to being a permanent family caregiver. She discusses learning to dress him and transfer him from one place to another, sitting up with him at night when he couldn’t urinate or move his bowels, and dealing with doctors and bureaucrats to obtain necessary equipment and services. There were happy times, like when she played the piano or guitar and sang his favorite songs, or when they went out to eat or to a concert. She also explains how she purchased a wheelchair accessible van and found people to drive it, so they wouldn’t always depend on the local para-transit service’s limited hours. In the end, she describes the painful decision she and Bill made to move him to a nursing home when he became too weak for her to care for him in September of 2012. He seemed to give up on life and passed away a month later. 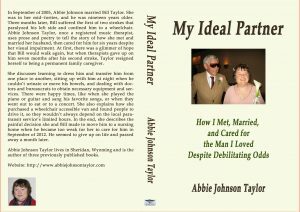 Click here to Order My Ideal Partner from Amazon in Kindle format. Click here to Order My Ideal Partner in print from Amazon. Click here to Order My Ideal Partner from Smashwords in various eBook formats. My Ideal Partner is now available from the regional talking book library in Salt Lake City, Utah. The catalog number is DBU04558. Other regional talking book libraries should be able to order it from Utah.